GREY DAY BY BERT BASSETT. Location: /Strings/Ukulele strings/Soprano Ukulele/SOPRANO UKULELE GUT STRINGS. Many musicians much preferred the unique tone given by gut strings. The problem was that untreated gut is very susceptible to moisture and soon begins to fray. 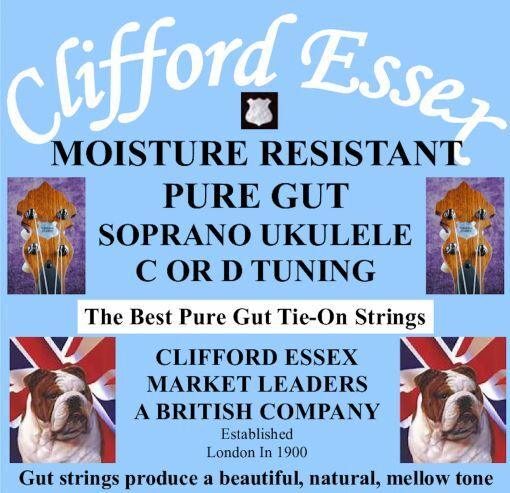 Using the very latest in modern technology this has been cured, our strings are treated with a hard-wearing moisture repellent which in no way affects the tone. These strings are all pure gut and generate a truly wonderful tone. Before fitting your strings please ensure the nut and bridge are free from sharp edges. The nut grooves should not be too deep and they should be perfectly smooth. These strings will repel the moisture in your fingers. Many years of research have gone into the production of these completely hand made strings and we firmly believe they are among the best ukulele strings in the world. Strings 3 Sets: 10% Discount. (+£17.00) No Thanks.